This black and white oval decal features the soldier's cross and "ALL GAVE SOME - SOME GAVE ALL" around the edge. From Anonymous of Wilmer, Alabama on 4/6/2016 . From David Carby of Welches, Oregon on 4/5/2016 . This decal says it all...proud to have it added to the back of my truck. The quality is very good. From Anonymous of Tulsa, Oklahoma on 4/5/2016 . From Jim Loney of Asbury, Iowa on 4/4/2016 . I just received my order and I am very pleased with the quality of this order. The shipping time was good and I thank you for your service for our hero's. 3/22/2016 – What size is it? 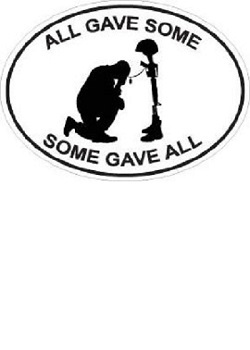 Response From Patriot Guard Riders: This black and white oval decal features the soldier's cross and "ALL GAVE SOME - SOME GAVE ALL" around the edge. Dimensions: 3" x 4"